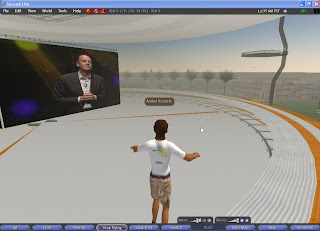 You can now see the recording of Lotusphere 2007 Opening Session (with guest speaker Neil Armstrong) available on 3-D chat Second Life and on IBM's web site. It's 2 hours 13 minutes long, so it's probably a good idea to watch it at home instead of dong it at work. To see the recording in Second Life, go to IBM Theater on IBM Island and click on the big TV screen. In a couple of seconds you'll see the video on 4 TV screens. Below is a screenshot of me watching Mike Rhodin's opening speech. In the middle right corner of the screenshot you can see Virtual Lotusphere building where you can (if you are lucky) meet other Lotusphere interested people. I hope that more IBM employees and business partners discover the Second Life program and IBM island. Do you like playing the game where you need to use wonderland Gold, when you do not have wonderland online Gold, you must borrow wonderland money from friends, or you buy wonderland Gold. If you get cheap wonderland online Gold, you can continue this game. Do you like playing the game where you need to use flyff penya, when you do not have flyff money, you must borrow flyff gold from friends, or you buy flyff penya. If you get cheap penya, you can continue this game.